Andre Iguodala has missed the past six games with a bruised left knee. The Cleveland Cavaliers are back to enjoying the comforts of home, but their uphill climb against the Golden State Warriors is about to get steeper with Andre Iguodala’s return. Though Iguodala is officially listed as a game-time decision for Game 3 at Quicken Loans Arena, Warriors coach Steve Kerr was forthcoming on Wednesday to say there is a “good chance” the forward will play. After suffering a bruised left knee in Game 3 of the Western Conference Finals, Iguodala has been sidelined for the past six games. 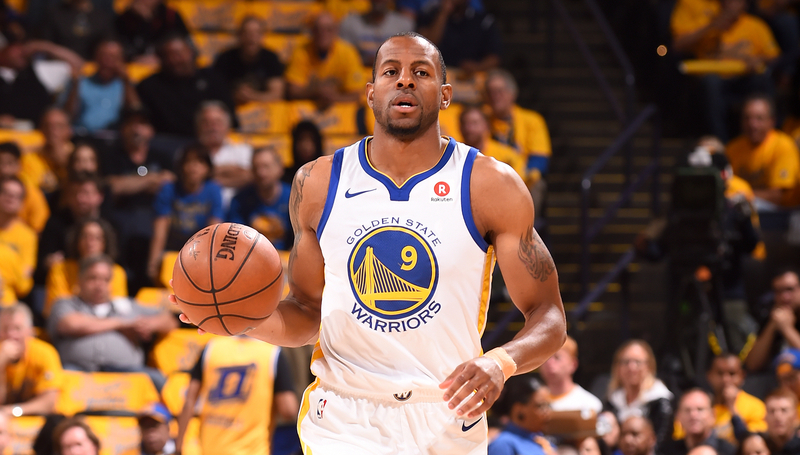 While he may not play his usual minutes immediately as Kerr eases him back, Iguodala will immediately give a boost to Golden State on both sides of the ball. Defensively, he gives the Warriors another body to throw on LeBron James, whether it’s full-time or sparingly. Iguodala has a history of at least bothering James, which includes him picking up Finals MVP honours in 2015 for “limiting” LeBron to 35.8 points per game on 39.8 per cent shooting. Him being back in the lineup also allows Golden State to be more comfortable switching everything when they roll out the ‘Hamptons 5’. So far in the series, the Warriors have mostly trotted out either Kevon Looney, JaVale McGee or Jordan Bell alongside their All-Star foursome, with varying degrees of success – the Looney lineup has an offensive rating of 114.1 and a defensive rating of 108.9 in 23 minutes; the McGee lineup has an offensive rating of 136.4 and a defensive rating of 122.8 in 19 minutes; and the Bell lineup has an offensive rating of 138.9 and a defensive rating of 138.6 in 10 minutes. When Iguodala has been healthy in these playoffs, the Hamptons 5 have an offensive rating of 123.9 and a defensive rating of 101.1 in 110 minutes. They’ve not collectively faced LeBron yet but that lineup is a step above any other combination of players Golden State can throw on the court. Offensively, Iguodala adds more spacing, even if Cleveland will live with him launching from the perimeter. Looney, McGee and Bell have served as capable roll men after setting screens, but Iguodala will allow the Warriors to play five-out, affording Stephen Curry and Kevin Durant more room to work with off the dribble. But even more than the spacing boost he brings, Iguodala’s playmaking skills have been severely missed. Draymond Green does well as the trigger man at the top of the key, but Iguodala is a secondary point guard who allows Curry and Durant to operate more without the ball, which is when Golden State are at their deadliest. Just what LeBron and the Cavaliers needed – another weapon for the Warriors to wield. Kevin Love has had his hands full defending Stephen Curry one-on-one. It’s now or never for the Cleveland Cavaliers, whose season will be on the line in a must-win Game 3 as the NBA Finals shift to Quicken Loans Arena. No team in NBA history has ever overcome a 3-0 series hole and that task seems even more impossible against this talented Golden State Warriors side, which means Cleveland are out of time for figuring things out. Their defensive coverages have to be tight and their shooting has to bounce back on Wednesday night if they hope to make this a series, instead of the lopsided affair it was last year. The Cavaliers’ adjustments will centre on defence, where they’ll have to come up with a way to slow down Golden State’s prolific attack to give them some sort of margin for error on the other end of the floor. It all starts with containing Stephen Curry, who has already hit 14 triples in the series, including a Finals record nine in Game 2. Cleveland’s game plan has so far mostly been to switch everything defensively, except when Curry hunts out Kevin Love for a mismatch. In those situations, the Cavaliers have tried to avoid leaving Love on an island with Curry by trapping or having Love jump out aggressively to invite Curry drives. That strategy wasn’t an unequivocal success in Game 1, but Cleveland managed to not get completely dismantled on those possessions. 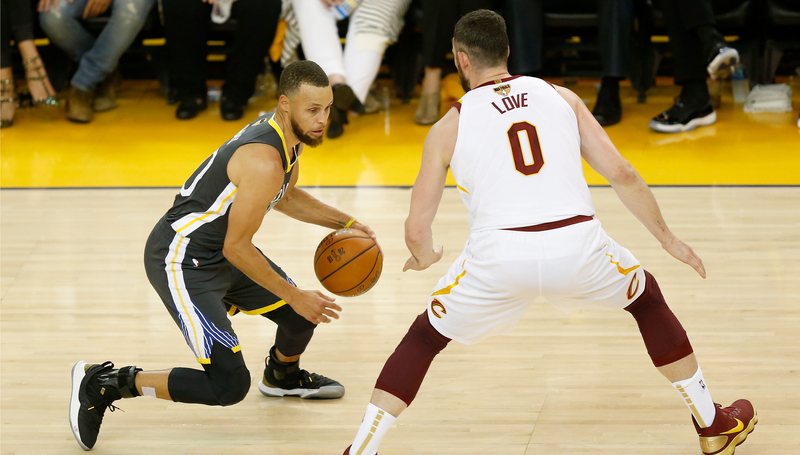 That wasn’t the case in Game 2, however, as the Warriors countered by having the screen-setter slip before the Cavaliers could switch, which left the defence in a confused state and a Golden State big man diving uncovered to the basket. When Cleveland abandoned that approach and just had everyone switch all the time, Curry smoked them by catching fire and splashing 3s off the dribble. There’s no real right answer for how to guard Curry, but it may be time for Cleveland to break out their trapping method, which they used with relative success in the pre-Kevin Durant clashes. That means having not just Love, but every Cavaliers player involved in the Curry screen swarm him to force the ball out of his hands. From there, Cleveland will have to hold up in a 4-on-3 situation on the back end, but that becomes easier when Golden State are playing two non-shooters with either JaVale McGee, Kevon Looney or Jordan Bell alongside Draymond Green. That would absolve the players involved in the Curry screen of having to constantly be in the right position, but it would still require constant communication for the other defenders to overcome a math equation not in their favour. “That’s our game plan defensively,” Tristan Thompson said of the switch-everything scheme. “We saw Houston do a good job doing that so we piggybacked that. With that said, we have to do a better job of communicating. Offensively for the Cavaliers, it may be as simple as knocking down shots. With the ball constantly in LeBron James’ hands, Cleveland are generating good looks as the Warriors have had to pick their position between letting James feast one-on-one or force his teammates to beat them. The latter hasn’t happened yet as the Cavaliers are just 8-of-32 on 3-pointers off James’ passes in the series, including 5-of-16 when it’s been an uncontested shot. J.R. Smith has been representative of Cleveland’s shooting woes as he’s converting just 26.3 per cent from the field through two games. However, he was also next to useless in the first two games in Boston last round before going 6-of-10 from deep in the following two games at home. That was also the case in the past two Finals – Smith shot 7-of-18 from deep in 2016 and 10-of-19 last year in the Cavaliers’ first two home games of the series after going 2-of-7 and 1-of-4 on the road, respectively. He rebounds after he disappoints. You should expect big things from him at some point this series. Smith and the rest of Cleveland’s role players are out of excuses now. They’ll have the comfort of being at home and more open shots are likely on the way with Golden State keying in on James. This will be the last chance they have at making this a competitive series. Former basketball player Gaafar ElSouri was a dual-sports athlete competing in both basketball and football. Dubai-based since 2014, ElSouri started his career in Saudi Arabia with Al-Hilal basketball club and his career included stints in Europe, Southeast Asia and Canada. Last year however, a torn anterior cruciate ligament (ACL) required him to have full knee reconstructive surgery, leaving him on the treatment table. ElSouri has been documenting his recovery back to fitness for the last twelve months. His physically challenging workouts are designed specifically to get him back playing on the court. In a series of articles, coinciding with the NBA Playoff finals, we’ll be breaking down ElSouri’s workout clips with the individual exercises you can do to get yourself in top condition. The first in the series focuses on core exercises, to help during practice and game situations, increasing stamina and cardio to help keep focused for longer. This exercise is used to warm up and drive foot speed, while remaining under control to ensure two feet go into each box. Doing this activates the upper body, while building both core strength and improving coordination. Here you engage your core and work on stability as the offset hand position forces your shoulders, chest and core to stabilise your body. This exercise relies on your core strength, chest and shoulders to stabilise your body and control your movement. It requires balance and concentration as well as strength. A tough one, this is an advanced movement that is designed for explosion utilising the core, upper body and overall body control. 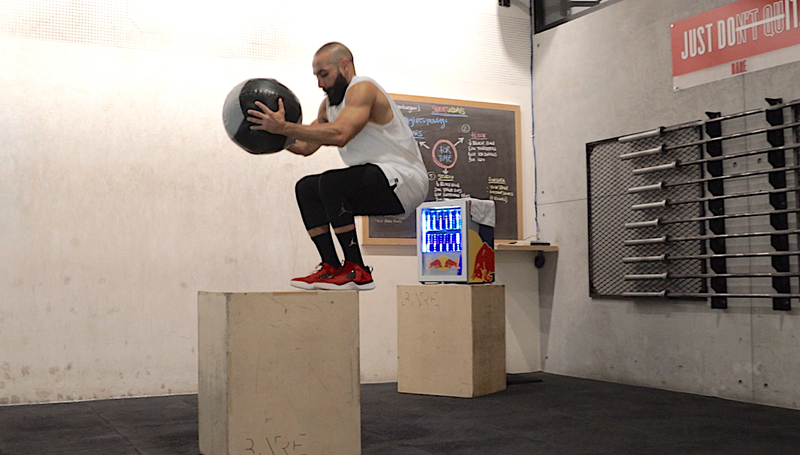 Using a medicine ball ensures your core creates the explosive movement generating power to throw ball as powerful as possible. It looks easier than it is, this exercise is used to improve foot speed, lateral steps and foot coordination. It requires speed and concentration. You need good coordination to complete this three-count combo moving forward while increasing foot speed in and out of the boxes.